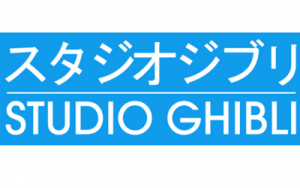 When I think of the famous Japanese animation company Studio Ghibli, several things come to mind: fantastic worlds, brave young female protagonists, nuanced antagonists, and a certain giant gray bear-rabbit spirit named Totoro. I also think of a man named Hayao Miyazaki. In large measure Hayao Miyazaki is synonymous with Studio Ghibli. Often referred to (somewhat clumsily) as the “Walt Disney of Japan,” he co-founded Studio Ghibli in 1985 along with three other men, and for the past 30 years he has elevated and expanded the boundaries of Japanese cinema to widespread international recognition. But Miyazaki hasn’t been the only Ghibli creative at work these last three decades. From 1988’s heartbreaking Grave of the Firefliesopens a new window to this year’s English release of Only Yesterdayopens a new window, fellow founder Isao Takahata has enjoyed a long and prestigious career as well. Compared to Miyazaki’s dream-like and wonder-filled creations, Takahata’s usually more down-to-earth subjects and realistic productions can perhaps leave one feeling underwhelmed. But even though safflower fields don’t offer the same excitement as spirit bathhousesopens a new window, as I’ve watched and rewatched Takahata’s work I’ve grown to appreciate his explorations of familial and environmental themes. At least in this non-film-critic’s eyes, he stands as an equal to the great Hayao. 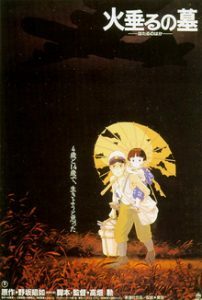 While Takahata had been involved with animation since 1961, 1988’s devastating Grave of the Fireflies was the first film he directed for his own studio. You couldn’t have a much sadder start. Grave of the Fireflies is the story of two children, Seita and Setsuko, wandering destitute in a war-ravaged Japan during the final months of World War II. Although the film was a mostly realistic, semi-biographical movie, animation was still largely considered the realm of the magical and the fantastic in 1991. So when Takahata wrote and directed Only Yesterday, a realistic animated drama, it made waves–especially after it turned out to be a big Japanese box office hit. 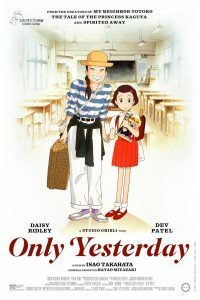 Set in 1980s Tokyo, Only Yesterday follows 27-year-old Taeko Okajima trying to come to terms with adulthood. As she schedules a working vacation picking safflowers in rural Japan, childhood memories keep popping up to amuse and confuse her (and delight the viewer). It’s a unique film that frankly shows what life was like for a girl growing up in the tail end of 60s Japan, from first period to first crush. It also manages to make salient points about organic farming, eco stewardship, and post-collegiate ennui. Still on an environmental bent, Mr. Takahata stuck to exploring themes of urbanization and its effects in 1994’s Pom Pokoopens a new window. In this film, a group of anthropomorphic shape-shifting tanuki (referred to as raccoons in the English translation) decide to fight the construction of the (real life) residential New Tama Town development outside of Tokyo. Part mockumentary, part environmental fairy tale, part elegy for a countryside that will never be the same, Pom Poko will make you laugh while tugging at your heartstrings. Less a coherent story and more a series of vignettes, 1999’s My Neighbors the Yamadasopens a new window shows the seemingly trivial triumphs and struggles of a family navigating modern life. The animation fittingly has a simple sketch-like quality that pairs well with the film’s structure. That said, My Neighbors the Yamadas has some particularly lovely animated segments. It’s a sweet (flirting with sentimental) film, but in my opinion, it’s Takahata’s least interesting to date. 2013’s The Tale of Princess Kaguyaopens a new window, on the other hand, is just wonderful. It’s an absolutely beautiful retelling of The Tale of the Bamboo Cutteropens a new window. When a lowly bamboo cutter finds a miniature child inside a bamboo stalk, he and his wife decide to raise her as their own. As she grows, so does the family’s wealth, which leads to complications I’ll let you discover for yourself. 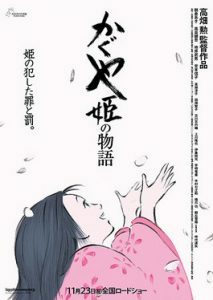 There’s a clear throughline from the animation style of My Neighbors the Yamadas to the visually mesmerizing linework and watercolor feel present in The Tale of Princess Kaguya, but Kaguya has a compelling (if somewhat bizarre) story to match its visuals. Well that’s enough from me. All of these movies are available in our collection– give Mr. Takahata a try and let us know what you think.